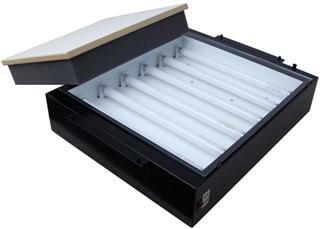 "One Stop Shop For Your Creative Mind"
This exposure unit is a great compact unit that has a UV black light system for the perfect frequency and minimum exposure time. This unit has an exclusive artwork pin registration that allows you to pre-register your artwork for a faster set-up. This table top unit takes up very little space and stores easily. Works great with frames up to 20x24 OD.